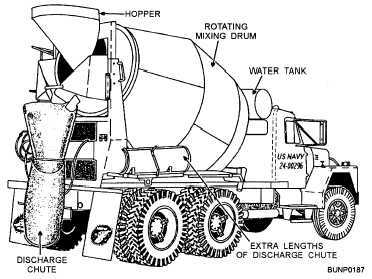 mixed in a continuous mixer and the mobile concrete mixer (crete mobile) where weighing facilities are not at hand. Specifications generally require that materials be measured in individual batches within the following percentages of accuracy: cement 1%, aggregate 2%, water 1%, and air-entraining admixtures 3%. The equipment used should be capable of measuring quantities within these tolerances for the smallest to the largest batch of concrete produced. The accuracy of the batching equipment should be checked periodically and adjusted when necessary. Concrete should be mixed until it is uniform in appearance and all the ingredients are evenly distributed. Mixers should not be loaded above their rated capacities and should be operated at approximately the speeds for which they were designed. If the blades of the mixer become worn or coated with hardened concrete, the mixing action will be less efficient. Worn blades should be replaced and the hardened concrete removed periodically, preferably after each production of concrete. agitating speed. Agitating speed is usually about 2 to 6 revolutions per minute, and mixing speed is generally about 6 to 18 revolutions per minute. Mixing for long periods of time at high speeds, about 1 or more hours, can result in concrete strength loss, temperature rise, excessive loss of entrained air, and accelerated slump loss. Concrete, mixed in a transit mixer, should be delivered and discharged within 1 1/2 hours or before the drum has revolved 300 times after the introduction of water to cement and aggregates or the cement to the aggregates. Mixers and agitators should always be operated within the limits of the volume and speed of rotation designated by the equipment manufacturer. OVERMIXING CONCRETE. - Overmixing concrete damages the quality of the concrete, tends to grind the aggregate into smaller pieces, increases the temperature of the mix, lowers the slump, decreases air entrainment, and decreases the strength of the concrete. Also, overmixing puts needless wear on the drum and blades of the transit mixer. Figure 3-15. - Transit mixer.